I mentioned in my last post about the dominance of Ford this season, specifically the SHR Fords. While yes a few of the SHR drivers only made it into the round of 8 by the skin of the teeth the point is they made it. That is an impressive feat. Think about this little factoid: Stewart-Haas Racing drivers now make up HALF of the playoff field. HALF!!! I think that might be considered a fairly impressive showing. I hope that any detractors who were vocal about the team switching manufacturers are eating their words right now. I do not deny that there wasn’t a money factor involved- but the fact that under the bowtie SHR would have never likely gotten the resources or opportunity to be the powerhouse team for that manufacturer- those claims have always gone to HMS. I think you could pretty much say that right now SHR is the powerhouse team for the blue oval right? For those keeping track of manufacturers in the round of eight, there are five Fords (all of the SHR drivers and Joey Logano), two Toyotas (Kyle Busch and Martin Truex Jr) and one lone Chevy (Chase Elliott). Stewart-Haas Racing has every reason to proud as heck of their hard work right now. 1. I find it interesting that Kyle Busch’s recent back-to-back sweeps has sparked a lot of interest but not in the way you would think. Instead of everyone being a buzz about what a monumental accomplishment back-to-back weekend sweeps (even haters have to be impressed) are, most of the buzz I am hearing is from NASCAR fans who don’t think that the cup drivers should be able to drive in any of the feeder series but instead should be relegated to just driving the premiere cup series. If this is the case (and I don’t believe this should be the case AT ALL just to make that clear) then by following that same logic new drivers should not drive in the cup series until they have a full time cup ride. See? Cup drivers driving in the series not just give the up-and-coming racers different driving levels and styles to drive with and around (the thought here being is that they can learn from the cup series regulars) but there is the bigger draw to having the cup drivers participate in races in the “lesser” series and that is that you are drawing fans to seats that might not have otherwise been filled. I honestly don’t see a problem with it. It’s not like the cup drivers can run for the lesser series championships anymore so I don’t really see why it’s a big deal- they should be able to run if they have the ride and sponsorship to do so. 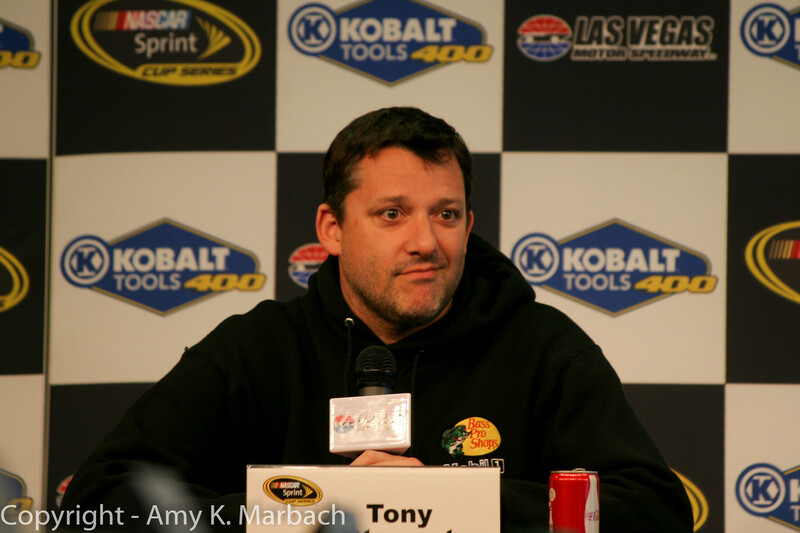 I know that when Tony occasionally would run what is now the Xfinity series I would be more apt to tune in and pay attention then not. 1. Wow- 10 “Loose Lugnuts” posts already? Not bad for just kind of a fun list. Like I said this is actually one of my favorite posts I write because it’s totally how I think- it’s just kind of a stream-of-conscious type thing. This seems to be a fairly post so I will keep it up! It’s been a heckuva week for this Jeff Gordon girl. I have been semi mum (for me anyway) on the subject because frankly the emotions were too high. Aside from a handful of angry tweets and some pointed re-tweets, I have been mum…but now that it is all said and done ,and I can contemplate the events of the last week without fire steaming from my nostrils, let me tell you what it was like for me and I am sure most of the 24 fans. Richmond Penalties: Why They Aren’t Quite Enough & Fans Have Opinions Too You Know. I really do NOT want to continue to beat a dead horse by going into the Richmond stuff again- but I feel that I have to respond to the penalties that followed the NASCAR race at Richmond especially after I posted my opinions on what happened during the race and what I thought NASCAR should do and what I thought they would do (which as I mentioned were two separate things). I posted an initial reaction to the penalties on my Facebook page, and retweeted several tweets if you follow me there- but I really feel the need to expound on what I said in both places. Richmond, a d-shaped 3/4 mile track in Virgina, is one of NASCAR’s crown jewel short tracks and the stage for the last regular season race of the Sprint Cup season or as NASCAR fans know it “The race for the Chase.” The chase- by design is a 10 race shootout of tracks for the championship where the points are basically zeroed out- with a seeding by number of wins for the top ten drivers with the including of two non-seeded, wild card drivers. Only the top 12 drivers in the regular season have a chance at the championship as the Chase currently stands- making these last ten “chase” races the play-offs of NASCAR. One of the interesting effects since NASCAR went to a “play-offs” type championship seasons is that just making the CHASE becomes the main goal for teams. Also, as a result of this system- there is the “bubble” who is in and who is out.